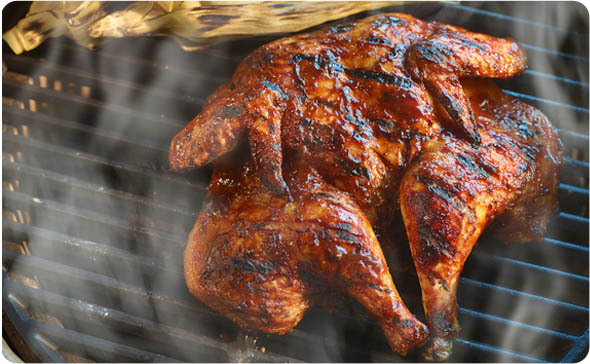 An easy to follow recipe for grilling a whole chicken to juicy and delicious perfection! Lay the chicken flat, breast side up, onto a baking sheet lined with aluminum foil. Brush the chicken with the vegetable oil. Mix the Chicken Base, ketchup, brown sugar, cider vinegar, paprika, Hot Sauce, garlic powder, chili powder and black pepper in a small mixing bowl. Rub the chicken under the skin and outside of the skin with the barbeque sauce. Cover the chicken with plastic wrap and refrigerate for 2 hours and up to 8 hours. Remove the chicken from the refrigerator and let it rest while the grill is heating. Place the chicken onto the grill skin side down. Grill for 15 minutes. Turn the chicken and continue to cook for 35 - 40 minutes or until the internal temperature reaches 165°F. Remove the chicken from the grill and let rest for 10 minutes before slicing.